One of the interesting things about the Apple House is that the bathrooms were recently renovated, and they’re nicely done. There’s no reason to undo decent work, even if it isn’t exciting stuff. I would never waste well done construction, I’ll make it work. My starting point is a little… dark, though. The walls and ceiling are a shade of blue-grey (not a bad choice, previous owners) and obviously the vanity light doesn’t throw much light. That’s outrageous! ITS ONLY FUNCTION IS TO THROW LIGHT. Light fixtures of the world: you serve a noble purpose! You throw light around rooms for people who can’t see in the dark. You’re noble, you save lives when you do your jobs well. This light, though, is giving y’all a bad reputation. I need a solution. 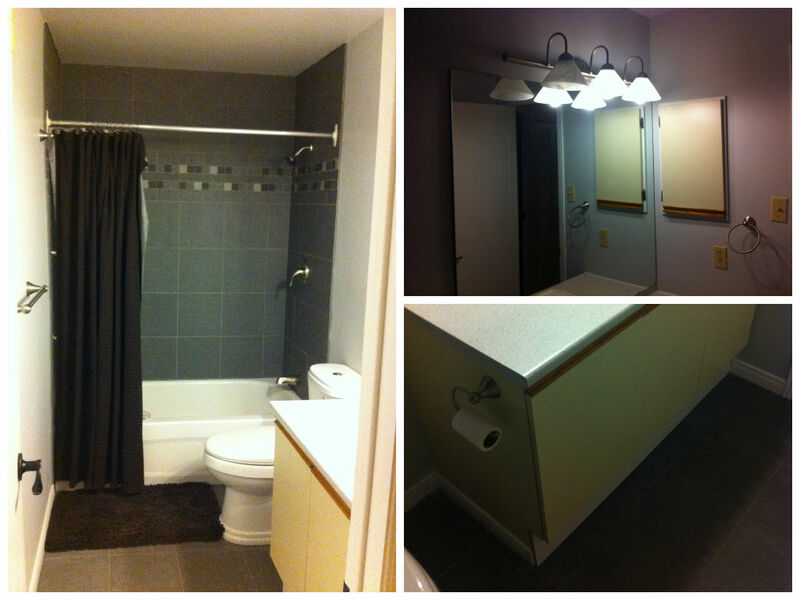 The bathroom vanity is original to the house, the counter top is laminate, the sink is fairly new, the taps are okay. Given all of this, I think I’ll donate the entire unit to Habitat for Humanity. It can be installed in a house right now, or sold to support building houses for low income families. I’m 100% into that, always. In 2007, I took a solo trip to Morocco and I took a lot of pictures, like you do. I worked really hard on developing my pictures, probably too much, because as soon as I had them printed and was satisfied with them, I became unbearably bored with my prints and just wanted to get rid of them. I never hung them unless I had to (had to is defined as staging the house or doing a rush job on decorating a room for guests). – I brought back two hand of Fatima door knockers from Morocco. One is antique and graceful, the other is very small and crude, but very very sweet. The smaller hand was a gift for Mark, the antique is mine. They’ve been waiting for a home for 7 years, and it’s about time I put them up somewhere. Maybe one on the bathroom door, maybe one the vanity or on the medicine cabinet. – find a mirror like the one in the inspiration photograph in the upper right hand corner, but that’s gonna take some looking and budgeting. It’s a Moroccan bone inlay mirror, and they’re available here and there. – and finally, if the budget allows, getting an electrician to advise us on and install pot lights to bring light into every corner of the bathroom. This is it. This is the first plan for the new house. It’s the first fix. I described it to Mark, he likes it, and that’s good enough. This is good enough.